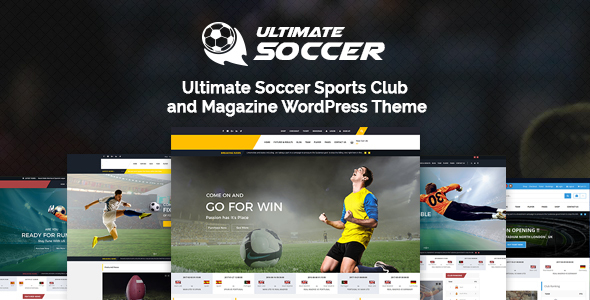 Ultimate Soccer WordPress theme offers complete fixtures management that fits on all sort of the sports content , magazine , blog layouts. A Superb way to handle the sports work like a charm showcase your clubs , matches , sell products etc. The theme has everything you need to built the sports club website. You can show the events , matches in the different listing styles. Manage and rank your club with the awards , gallery , achievements for your soccer , football and other teams etc. Now you can show your sports new in the breaking news section with different styles in the header , slider , below slider or in the top header area. Show the latest news of the sports in any layout you wish to have. This is important feature for your sports news site. Showcase your products and sell them with fully styled and equipments for your sports store with beyond limits level. You can sell the products of the sports like soccer ball , shirts etc as simple , variable price products with styled woocommerce widgets and can control the search of the price with the custom price filter widget. The theme offers you the liberty to manage the teams the way you wish. Its a power full tool to create your teams , associate the players with the team , manage the profile , gallery , news , and the team over all statistics. Control every player with its information , team , profile , ranking , date of birth and other information easily from the players custom post type. This is the stunning feature which has made easier to manage the players with such an easier task that is never imagined before. UltimateSoccer is specially designed for the sports sites which includes the matches , fixtures management which helps you to set up the matches between two teams , select the players , enter the required information like the goals , red cards , yellow cards etc. Theme has unique feature of displaying the points in the table view. You can show the team ranking there points. The points keeps changes when the team matches are updated. It is fully flexible , easy to manage and controlled in elegant way to demonstrate the results. The polling is made very easy through the widget provided with the theme where you can set up the polls for your users site easily. The polling control is given in the hands of the users where it can be set up easily. UltimateSoccer offers the unique 7 headers for your sports site. You can select any of the header of your choice from the theme options settings panel. The complete control is given for customzing the headers. Start you shop easily. We turn many woocommerce’s elements in to minimal, modern design. This theme looks and works flawlessly across major phones and tablets. We integrated a lot of useful shortcodes which will surely empower your website. You can turn your site to anything you need with color options. You can change almost every color elements. Draw the side bar and manage it with with the control by setting its size. You can have parallax background in your desired section. You can also set parallax image , video or color of your choice. UltimateSoccer includes a a smarter collection of custom widgets, that allow even more manage the points tables in the widget area to show the single , multiple upcoming matches also you can show up the polls. Theme documentation covers all the possible questions, so that even a newbie can succeed to create a great website in a reasonable time. Many screen shots from admin panel and front-end to make it even easier. Also the video tutorial to set up the site are available.